In the beginning of the training session, the instructor introduces himself as Sonny Bonds. Sonny Bonds is the protagonist of the first three of Sierra's classic Police Quest adventure games, created by Jim Walls (who named the classic character after one of his own sons, Sonny Walls). Sonny Bonds is also an available character in the Quick Mission Maker. A whole bunch of Sonny Bonds civilians and suspects in the Fairfax Residence, created with the Quick Mission Maker. An arcade machine of Freedom Force vs the 3rd Reich can be found on the second floor of the level Victory Imports Auto Center. Freedom Force vs the 3rd Reich is also a game created by Irrational Games. In the map "Meat Barn Restaurant" (multiplayer only), there is a SWAT arcade machine. In several game levels, a cardboard can be found of "Tribes: The Movie, coming March 2007". 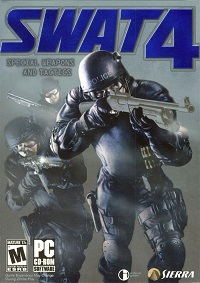 This is a reference to the game Tribes: Vengeance, also created by Irrational Games and published by Sierra/Vivendi in 2004, half a year before SWAT 4.